Musician Kanye West and TV personality Kim Kardashian (center), seen at the 2015 MTV Video Music Awards, welcomed a second child on Saturday, Dec. 5, 2015. Kim Kardashian finally showed the world her son Saint West Monday morning. In a post on her app, the newborn is seen sleeping peacefully in an all-white onesie. "Today is my dad's birthday," she wrote alongside the picture. "I know there's nothing more in the world he would have wanted than to meet his grandchildren. So I wanted to share this pic of Saint with you all." Kardashian's father, Robert Kardashian, passed away in 2003 at age 59. Also dad to Kourtney, Khloe and Rob Kardshian with ex-wife Kris Jenner, he is currently portrayed by actor David Schwimmer in the FX drama series "American Crime Story: The People vs O.J. Simpson." In a screenshot from kimkardashianwest.com and her app, Kim Kardashian posted her first-ever public picture of son Saint in tribute to her late father's birthday. 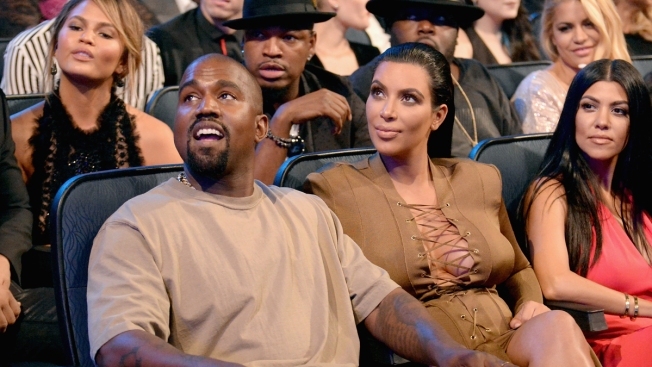 Kardashian and husband Kanye West welcomed their second child in early December. Daughter North was born in 2013. For more than two months the celebrity parents haven’t revealed much of the baby boy, except for one previous photo where he is seen squeezing his famous mom’s hand.